Established in the early 1920s and based alongside Botany Bay, the city's airport soon grew into a substantial aerodrome, with commercial flights quite literally 'taking off' over subsequent decades. Today, Sydney's Kingsford Smith Airport (SYD) handles more than 30 million passengers every single year, with roughly two-thirds of these passengers being domestic. In total, there are around 300,000 annual flights, which between them serve in the region of 50 domestic destinations, whilst also connecting various international cities within other continents. Currently the busiest air facility in the entire country, Sydney Airport functions as a major hub for Qantas Airways, as well as both Jetstar and Virgin Australia. 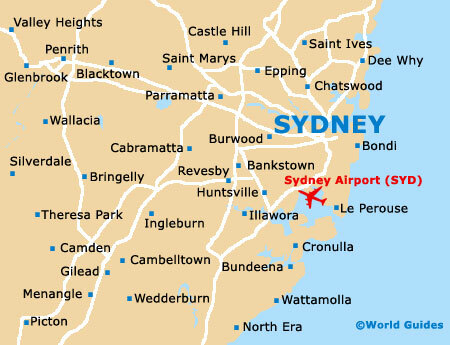 The city's airport is located just 9 km / 6 miles to the south of central Sydney, being based alongside the suburbs of Arncliffe, Botany, Kyeemagh, Pagewood and St. Peters. The Southern Cross Drive (Freeway 1) heads into the city centre, towards Potts Point. 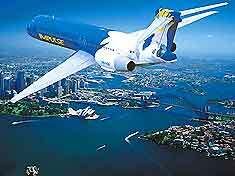 Sydney's Kingsford Smith Airport has three large terminals, serving a number of national and international airlines. These include Aerolineas Argentinas, Air New Zealand, British Airways, Emirates, Garuda Indonesia, Jetstar, Qantas / QantasLink, Regional Express Airlines, Thai Airways International, Tiger Airways Australia, United Airlines, Virgin Atlantic Airways and Virgin Australia. The Sydney Kingsford Smith International Airport offers good onward road connections, which head out in all directions and link nearby Hurstville and Kirrawee (south), Padstow and Moorebank (west), and Drummoyne, Crows Nest and North Ryde (north). Those driving into the city centre itself will find that the M1 motorway (Southern Cross Drive) provides the quickest connection, while those looking to drive into south-western Sydney should note that the M5 Motorway is the way to go. The airport itself is encircled by a busy ring road, which is made up of roads such as the General Holmes Drive, Marsh Street and Qantas Drive, as well as the M5 Motorway (East). The Airport and East Hills railway line provides a convenient underground connection to the airport, belonging to the Cityrail suburban network. The onsite railway stations are to be found beneath the International Terminal and also beneath the car park (in between the Domestic Terminals). 'Gate fees' are applicable upon entrance, with this amount being deducted from the overall price of any train tickets subsequently purchased. Those heading into the city centre by rail will be pleased to learn that this journey takes just 13 minutes, with trains departing roughly every ten minutes or thereabouts. Operated by the State Transit Authority of New South Wales, Sydney's international airport (SYD) is served by numerous public buses, which travel on a daily basis between the hours of 05:00 and 23:00. Bus route no. 400 connects the train stations of Burwood and Bondi, collecting passengers from the domestic and international terminals. Private shuttles present a popular alternative for those planning a journey to the Blue Mountains and the Sutherland Shire area, as well as along the coastline. Various shuttles are operated by both Kingsford Smith Transport and Sydney Airporter. These shuttle buses travel to many of the hotels in central Sydney, as well as those based within the Kings Cross and Harbour areas of the city. When booking your hotel, it is worth asking whether or not a complimentary shuttle will be available for pick-ups and drop-offs. A large number of airport taxis are based here, being situated outside of each of the terminal buildings, in specific taxi rank areas. Curbside supervisors ensure that all runs smoothly and can provide assistance where necessary. Popular taxi destinations include the city centre and northern Sydney, as well as Cronulla, Liverpool, Manly and Parramatta. Taxi companies operating here include Legion Cabs, Premier Cabs, RSL Ex-Servicemen's, Silver Service and St. George's. If you would rather splash out on a limo, then head to International Arrivals, where the reservation desk of Royal Limousines is based.